Debi Boies had recently lost her own 12-year-old Doberman, and it wasn’t long before she began searching for another dog to bring into her South Carolina home. Her search was successful, but one problem remained. How would her new Doberman get from Florida to upstate South Carolina? Rescue Volunteer with a lucky doberman puppy. 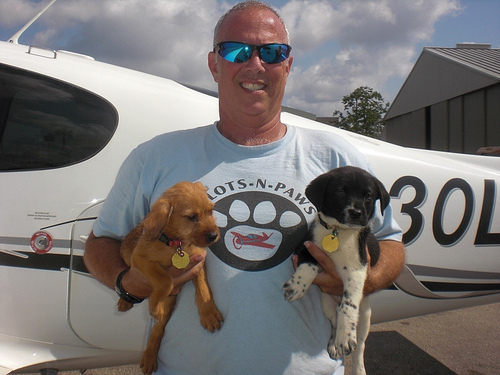 Since the first official flight in 2008, volunteer pilots have flown thousands of dogs, cats and other rescued animalsto new homes throughout the country. Currently, over 2000 pilots are registered on the website-based forum that provides a venue for rescue organizations to post their transport needs, and for pilots to respond with offers to fly the animals. And pilots help by doing what they do best, they fly. Except on Pilots N Paws missions, they do so with special passengers that are on their way to new forever homes, often after just escaping certain death at overcrowded shelters. They live because people make a choice to save them, and then pilots use their skills and time to fly them hundreds or thousands of miles to safety. Pilot Jeff Bennett with two of the the thousands of animals saved. The effect on those who volunteer is best expressed in their own words: “This is the most rewarding flight I have ever made”, “I love dogs, I love to fly so why not make a difference?”, “This flight was the first time I have cried in years after one of my passengers stood on her paws and kissed my face”, “Such a good dog, I could not have had a better co-pilot”, “Sometimes a certain rescue flight stays with you forever, this one’s my forever one”, a great day for flying with rescues on board”. Volunteer pilots speak of the rescue organizations as angels, and the organizations speak of the pilots as angels. All the animals know is that life is now good, and for those that saved them, that’s enough. 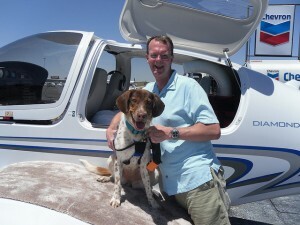 To learn more or to volunteer, visit Pilots N Paws.